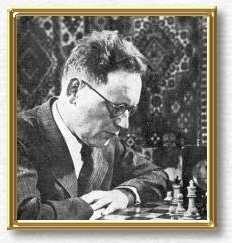 Mikhail Moiseevich Botvinnik was born in St Petersburg, Russia in 1911. He learned to play chess at the age of 12. An electrical engineer by training, he was the first Russian to hold the World Championship title after he won the 1948 tournament following the death of Alexander Alekhine. He held on to the world title until his defeat by Petrosian in 1963, except for two occasions when he lost the title for one year, to Smyslov (1957 - 1958) and Tal (1960 - 1961). Botvinnik was very serious about chess	and never played for fun. After his defeat to Petrosian he trained other Soviet players and devised a training programme. He advocated practicing with strong players, studying master games, publicizing analysis to be criticized by others, learning to handle the clock to avoid time trouble and to concentrate in spite of disturbances. Although he was a non-smoker, he often practiced with heavy smokers to practice his ability to concentrate in adverse situations. He also stressed the importance of regular physical activity to maintain fitness. In 1970 he gave up playing in order to concentrate	on the development of chess computers.